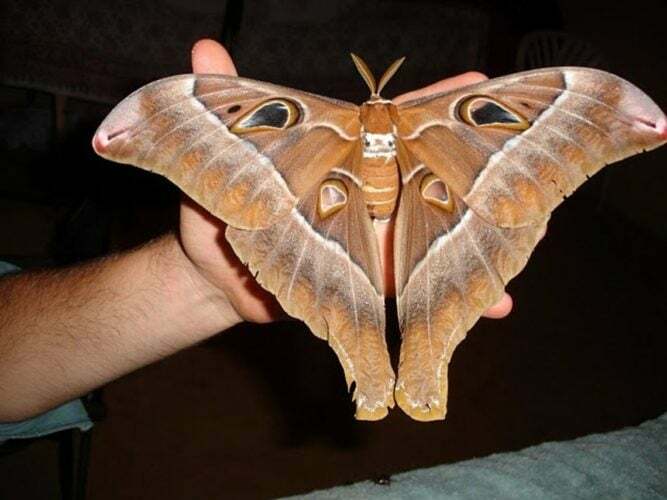 When it comes to big moths, no one, in my opinion, beats the Hercules Moth. Coscinocera hercules (Hercules moth) is a moth of the family Saturniidae, endemic to New Guinea and northern Australia. It has a wingspan of 27 centimeters (11 in), making it the largest moth found in Australia, and its wings have the largest documented surface area 300 sq cm (118 sq in) of any living insect. Hercules Moths occur in New Guinea and tropical Queensland. 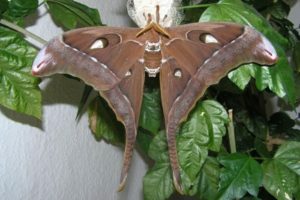 Adult moths do not feed and are short-lived. 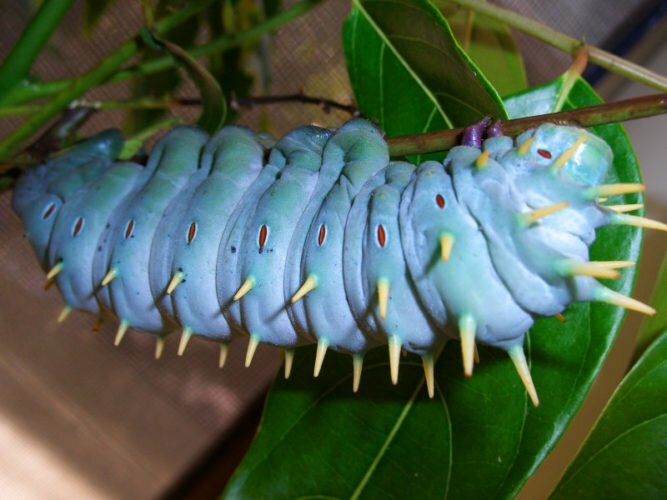 Their spectacular pale-blue caterpillars can grow to a length of 12cm (4 3/4 in) and a weight of 29g (1 oz). The caterpillars feed on leaves of several rainforest trees but prefer those of the Bleeding Heart tree, Omalanthus nutans. At the rear end they have 2 large, false eyes to confuse potential attackers. In its natural setting this species feeds on Dysoxylum muelleri, (Red Bean); Glochidion ferdinandi, (Cheese tree); Omalanthus novoguinensis, (Bleeding heart); Omalanthus nutans, (Native bleeding heart); Timonius rumphii, and Timonius singularis. 1.) Larvae often consume most or all of discarded skin. 2.) Females call in males by emitting pheromones. The males tend to be slightly smaller than the females, but have more vibrant coloration and longer “tails”. 3.) Gravid females lay 80-100 eggs singly or in small groups. 4.) Emerging larvae chew a hole through one side of the egg and struggle to extricate themselves. 5.) Late instar larvae get quite large 10cm (4 in), like to sip on water droplets, and take on a greenish-blue coloration.